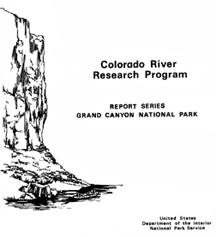 The Colorado River Research Program in Grand Canyon National Park was initiated by the National Park Service in 1973 to secure scientific data to provide a factual basis for the development and the implementation of a plan for appropriate visitor-use of the Colorado River from Lee's Ferry to Grand Wash Cliffs and for the effective management of the natural and cultural resources within the Inner Canyons. The intensified research program consists of a series of interdisciplinary investigations that deal with the resources of the riparian and the aquatic zones and with the visitor-uses including river-running, camping, hiking, and sight-seeing of these resources, as well as the impact of use and the upstream operations of Glen Canyon Dam upon canyon resources and visitor enjoyment. No. 1: Design and Method of the Sociological Research in the Grand Canyon. Bo Shelby and Joyce M. Nielsen. June, 1976. No. 2: Motors and Oars in the Grand Canyon. Bo Shelby and Joyce M. Nielsen. June, 1976. No. 3: Use Levels and Crowding in the Grand Canyon. Bo Shelby and Joyce M. Nielsen. June, 1976. No. 4: Private and Commercial Trips in the Grand Canyon. Bo Shelby and Joyce M. Nielsen. June, 1976. No. 5: Survey of Fishes, Mammals and Herpetofauna of the Colorado River in Grand Canyon. Royal D. Suttkus, Glenn H. Clemmer, Clyde Jones, and C. Robert Shoop. June, 1976. NOTE: Study #5 recommended the following on page 48: "Economic, biological, political and time facets should be explored for every conceivable plan to restore the habitat. A plan to restore a portion of the Colorado River in Grand Canyon area on a seasonal babsis (seasonally adjusted flows) to coincide with the spawning of [humpback chub] should be explored. Possible plans include: Removal of Glen Canyon Dam and construction of a by-pass around Glen Canyon Dam. No. 6: A Periphytic Microflora Analysis of the Colorado River and Major Tributaries in Grand Canyon And Vicinity. David B. Czamecki, Dean W. Blinn, Terrill Tompklns. June, 1976. No. 7: Alterations of Terrace Deposits and Beaches of the Colorado River in Grand Canyon. Alan D. Howard and Robert Dolan. July, 1976. No. 8: Limnologic Studies on the Colorado River from Lees Ferry to Diamond Creek. Gerald Cole and Dennis M. Kubly. June, 1976. No. 9: User Carrying Capacity for River-Running the Colorado River in the Grand Canyon. F. Yates Bordon. November, 1976. No. 10: An Ecological Survey of the Riparian Zone of the Colorado River between Lees Ferry and Grand Wash Cliffs. Steven W. Carothers and Others. June, 1976. No. 11:Human Waste Disposal on Beaches of the Colorado River in Grand Canyon. Robert A. Phillips and Cynthia Sortor Lynch. February, 1977. No. 12: Survey of Bacteria, Phytoplankton and Trace Chemistry of the Lower Colorado River and Tributaries in the Grand Canyon National Park. Milton R. Sommerfeld, Wayne M. Crayton and Nancy L. Crane. July, 1976. No. 13: Hydrology and Sedimentology of the Colorado River in Grand Canyon. Emmett M. Laursen and Elliot Silverston. December, 1976. No. 14: Summer Distribution and Reproductive Status of Fish of the Colorado River in Grand Canyon National Park and Vicinity, 1975. C. 0. Minckley and Dean W. Blinn. June, 1976. No. 15: Aquatic Investigation on the Colorado River from Separation Canyon to the Grand Cliffs, Grand Canyon National Park. James E. Deacon and John R. Baker. June, 1976. No. 16:An Economic Analysis of the River Running Industry in the Grand Canyon National Park. C. R. Michael Parent and F. E. Robeson. December, 1976. No. 17: Synthesis and Management Implications of the Colorado River Research Program. R. Roy Johnson, September, 1977. No. 18: Sound-Level Evaluations of Motor Noise from Pontoon Rafts in the Grand Canyon. D. N. Thompson, A. J. Rogers, Jr., F. Y. Borden. 1974. Celebrating the Grand Canyon. An environmental history of Grand Canyon by Jeff Ingram. 1999 - Wilderness Management Plan for Grand Canyon National Park and the Colorado River. McCully. 2002 - Motorized River Ranger Patrols in the Grand Canyon: Are They the Minimum Required for the Administration of Wilderness? Boussard.